Inkjet printing on fabric is a highly popular technique, due not least to the accessibility of the basic materials: desktop PCs and printers. There is strong interest from both textile artists and creative quilters, but the technical equipment can be an obstacle for many practitioners who have little or no IT skills. Inkjet Printing on Fabric will address these issues, and will guide textile practitioners to become confident textile printers, teaching them how to use their IT equipment as a printing tool as well as a design tool. 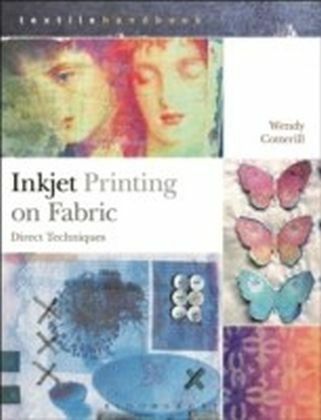 Much of the work featured in this book requires no in-depth specialist skills and highlights taking an experimental approach to using desktop technology, including step-by-step digital imaging techniques, and a demonstration of the use of specialist printing papers and mediums.Embracing technology in textile practice gives endless possibilities for developing new working methods and adapting traditional techniques. Inkjet Printing on Fabric brings these possibilities within the grasp of those with little or no specialist print studio facilities, and means that techniques that were once the domain of professional artists are now accessible to everyone.